It’s in the hands of a doctor, who they blindsided by handing him this picture and telling him that despite extensive testing, it was like no fiber known to exist. He handled it rather well, responding “one fiber does not make a new disease”, and we could very well leave it at that, since it sums things up nicely. But let’s take a closer look at the OSU evidence. We have tested three fibers, two blue, one red. We are completely unable to determine what these fibers are made from, because there is no match in any known databases. There isn’t even anything that is a close match. The red fiber is chemically different to the blue fibers. 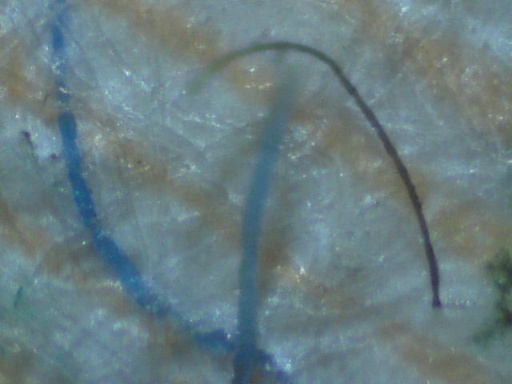 The blue fibers are chemically identical to each other. The fibers sat in acid and many other solvents we had for a week, but they did not leach color. Not, a lot, but at least it’s getting towards some scientific evidence. Unfortunately it really just raises a lot more questions than it answers. What about some simpler info on the fibers? How wide were they? How long? How ductile were they? Where did these fibers come from? Different people? What other symptoms did they have? How were the fibers extracted? Where on the body were they? How many other fibers did the person have? What parameters were used to search for the fibers in databases? What databases? FTIR? What is the statistical significance of not finding a substance in this database? What acid was used? How were they heated? 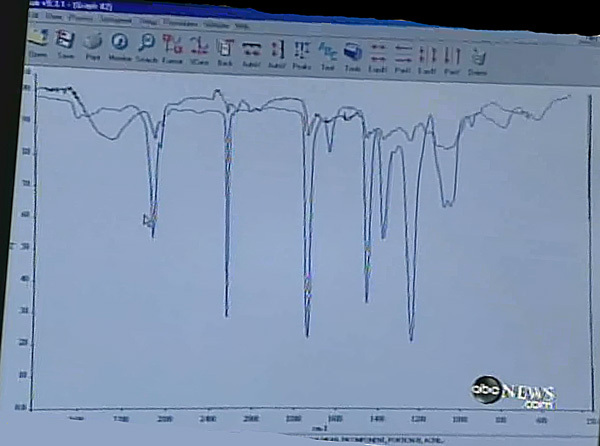 Is this a graph of the mystery material? Unfortunately it’s two graphs overlaid, so you can’t tell much. Why does Wymore not tell us what the peaks were for this fiber? I could go on, but the point is that this new evidence really suggests almost nothing. 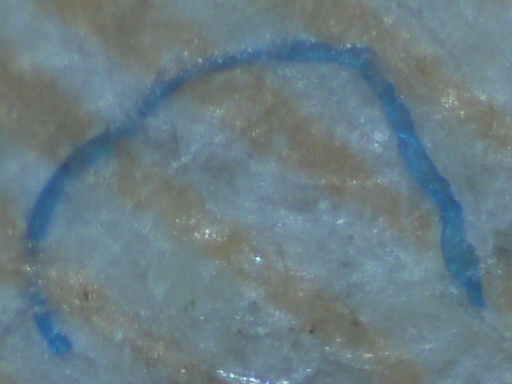 If anything the fact that the red and the blue fibers were different suggests that this is NOT something produced inside the body, as that would be much more likely to produce identical fibers. The high melting point of the fibers suggests it is not organic, which again is a point against it being produced inside the body. It point much more strongly to environmental contamination. So what we have is three unknown fibers, of unknown origin. The characteristics of these fibers seem to suggest they are not organic, hence were not produced inside the body. The wider question here is why Dr. Wymore is participating in this media extravaganza? he personally is convinced that “something” is going on with “some” morgellons patients. But refuses to say why. He’s even said he’s “months beyond” trying to explain why. yet he has no problem with appearing on television and hence convincing thousands of vulnerable people that they have a novel pathogen, and should ignore their doctor’s advice. Wymore is soliciting charitable contributions. He has a responsibility to explain why. What is blue, and does not melt at 1400F (760C)? Crocidolite for one. That’s blue asbestos. Of course that *should* show up in a good FTIR database. What else? Well, ceramic fibers will withstand the heat, but do they come in blue? You know, an old treatment to fireproof cotton was to treat it with borax. 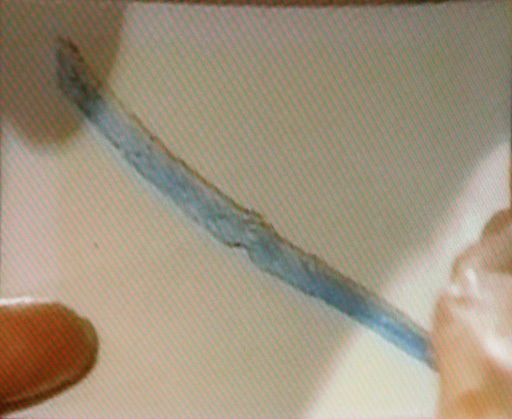 Morgellons believers wash their clothes in borax. Does the FBI have “cotton chemically altered by boiling it in Borax” in their database? What if it were cotton which was was sulfur dyed (which is very resistent to leaching, since it oxidizes within the fiber), and boiled in borax to make it heat resistent? Is “sulfur dyed cotton with borax” in the database? While I can accept that there is no proof that the fibers are being produced inside the body, I know for a personal fact that they reside in the flesh. My question then is, what inorganic fibers can get inside the flesh and/or be expelled in the fashion that has been described (even without lesions to pick on)? Can a person breathe something in, have it circulate throughout his/her body, and then have it deposited in the flesh where it later surfaces through the skin? I know you’re not ready to say that the fibers are “in the flesh” yet Michael, but I feel compelled to ask nonetheless. I don’t know about getting in via the lungs, but it’s well known that foreign objects sometimes get embedded in the skin, and are expelled months later, not always in the same place. If someone has a significant wound, maybe due to a car accident, or whatever, they could get clothing fibers embedded in the wound, and then have them emerge in odd places years later. People sometimes have surgical swabs left inside of them. Sometimes under the skin. Who knows what that might do. Sutures? They might not be removed properly. The point it, there are explanations, even if you discount the simplest one of environmental contamination. I conclude that Morgellons was created by the government or NWO in order to bring about change. $ is a huge factor. Also, I have concluded that there has been a cover-up. Morgellons might not be real. The govt is using this “” epidemic to weed out paranoid, delusional people. These people are RED FLAGGED and put on watch. I would also like to suggest that Morgellons might be from the waste in water. Unable to be treated or heated, the threads survive. Remember where the first reported cases were. Texas, Florida, California, and other coastal states, most of them southern. Thanks DIRTY SOUTH LOL. I have had fibers, as well as other particulates, embedded inside my epidermis. That isn’t unusual if the ph level of the acid mantle is too alkaline. Such an inbalance interferes with the renewal of our skin cells through its natural exfoliative cycle. Other damaging factors come into play as well, which can strip the acid mantle away, or, upset the balance otherwise, depending on what each person is doing to themselves to create a breach in their skins’ immunity. When I was on Lymebusters, I’d posted a thread on the topic of asbestos and other natural mineral fibers in outdoor air pollution. The San Francisco Bay Area had the highest content, due to deconstruction of so many old buildings in the region. I don’t recall the city, but Florida was another state, and I recall that Quebec, Canada was high also. Fibers would either remain trapped inside the lungs, or expectorated in phelgm. Asbestosis is highly possible for anyone who has had a prolonged exposure, to asbestos, and if they have lung symptoms, they should discusss that with a doctor and be x-rayed. Hey Jon, I’ll just have to fashion my flag into a nice red dress and run for president of the NWO. Michael, I’d love to move on with this theory (remember “asbestos” contamination at work was my first choice as an explaination for years), but it certainly doesn’t explain how the fibers got into my kids skin. They also get rashes w/fibers, but no scabby lesions. Oh well. Michael, use your discretion with that link I provided, as to whether to delete it. It is heavily laden, and I don’t wish to be a part of the problem. Skeptics, who may not have heard the broadcast, may be interested. I may be mistaken, but I believe cobalt can cause skin allergies. It would have definitely been in the database. So would formaldehyde, or any other chemically treated flame-retardent fibers. Permanent press clothing is treated with formaldehyde, so that’s real common. It causes a lot of illnesses too, of course, especially in such close contact with our skin, through the clothes we wear. I’m alittle curious now that I’ve read the aforementioned thread HaHa I also have this pestering disease, but my boyfriend mentioned that on our bed he finds alot of debris from the ceiling panels. Now these things are definately fiberglass based and very old and I believe some of the stuff I find on my body could be fiberglass fibers,but there is no way that is the whole story. I don’t even want to go into the details of what’s happening to me, but I want to go to teh CDC and volunteer to be researched on. We need to learn about this disease because this stuff is definately being spread by handshakes, money, any type of human interaction. I think we’re gonna have a big problem on our hands if the government doesn’t begin research on this or at least pour money into Dr. Randy Wymore’s research. I truly feel this stuff is all over only most people don’t know it yet. The CDC does not conduct clinical research, you should go to a University hospital medical center. Interesting you mention Money…. hang on, I’ll update the post. …… done. Some are glass……( I had these flying thru my house that weekend I hcame down with Morgellons….I watched as it was airborn and aiming straight towards me. It was clear (off beige in color) and one intered on top of my collarbone and the other my right forearm where my husband and I both saw it prick the skin-just like a needle then we watched in amazement as this thing began to look like it was a needle and invisible thread going in and out of my forearm, gathering up the skin around it…..it stopped about 15 seconds later and elevated itself on about a a 1/2 inch rectangle platform and someohow migrated up to right under the elbow line. It stayed just like this is this damn pedestal for 2 days…..
2 weeks later, I just dug it out og me thinking it was for sure bad for me. I’m positive it was a glass fiber. A chaff perhaps. I will tell you this though, I had recently changed to a new type of air filter that was more expensive. (12. for 2 filters) in my A/C unit. I’m still not convinced that they did not come from there…..
so, we have glass, ceramic, natural ones from the ocean and also fiber optics. Yes, that is what I said…..they can enter us thru mangetics and 2.4 ghertz microwaves….yeah, just like our computers run on…..I believe each time we turn on the switch to a 2.4 ghzt machine, that tiny glass fibers are entering our skin. Also, I had at that time a 2,4 ghz phone….bad thinking….. I should go trash the microwave as well, yet then I’d starve. LOL (just kidding). there, now come on back skepG and Walt disney (I forgot your username) and the 911 poster and tell me just how stupid my post is…..you know I don’t lie…..
London, you just seem to be all over the place. I do hope that you start to feel better physically, but I can’t beleive that flying glass or robotic wasps are causing your symptoms. Thanks for the info. One question I have. Do the fibers apprear to be living organisms? If you can’t tell me than I understand. According to the “Handbook for Physical Testing of Paper”, page 406, the flash point of cotton treated with N-methly-dimethyl-phosphonopropionamide is “over 650C). Seems pretty close. 911 your Username used to remind me of a beautiful porsche but now I only think of first Aid….. just joking…. Have you never heard of chaffs or chaffes? The military uses them is defense tactics where they drop them airborne from the planes and it hides their plane from the enemy behind a plume of smoke. 911, they do the practice runs for this all of the time…and a helluva lot of the coast of Cali, even though there is no need to do this with no enemy in site, they still get to let the glass chaffes fall down onto our envoronment..
not gonna let you make me look like the bad person here 911. PS: Michael, on my leave a reply line it said MKHS before I changed it. Michael – Media is our only hope. If the CDC are not convinced how else are we to convince them? Do you really think Dr Wymore is going to tell the media everything he knows? I don’t think so. You are so fixated on the fibers and how they come out of ths skin. I can not explain how these fibers come out of my mouth,nose, eyes and any other place you could imagine. I had a really bad lesion on my stomach a while ago. I call it a lesion but it was more like a pruritic type rash. It itched like hell and of course the skin just tears immediately. The strange thing though – normally when the body forms a scab it is a particular colour, but not this one the entire scab was BLUE. Now if you think I sat there and stuck carpet or clothes fluff in it, you really are crazy?!! To 911 – you asked a question about if the fibers appear to be a living organism? I would have to say YES. How else do these fibers curl themselves through my bed linen. The fibers don’t just thread themselves through once – but a few times. Michael – I have to say – the more I read some or your posts, along with Smileykins and Tallcotton. I think to myself – what on earth is wrong with you people. What are you frightened of? OR What it is you have to hide? Yes the fibers are weird and I would never have believed it myself. This has totally ravaged my body. The skin is the largest organ of the body, when an infection hits the skin – it is an outward sign that something is very wrong in the body. Well I am on a steroid and this crap is still happening to me. If you are convinced that fibers in lesion are carpet – FINE! But please explain why my hair (and the same for others also) grows into my forehead, cheeks, eyebrows and this is PAINFUL, it damn well hurts. I can not find a disease on the internet that explains this, can you. If you can I would welcome any feed back on how I can “disable” my head hair so to speak. A young woman like myself should not have to resort to shaving her head AGAIN!! 911 help me! I was wondering if you could explain this in easier terms for me, you do seem so much brighter than myself..
Wolbachia sometimes takes a more feminist approach. In many parasitic wasps, which lay their eggs in developing insects that they have killed, Wolbachia infections eliminate the need for males. An infected female reproduces via an asexual process known as parthenogenesis. The unfertilized eggs simply duplicate their one set of chromosomes and develop into females. Could some Wolbachia species infect vertebrates, or even humans, and play a role in their speciation? Decades ago, researchers tried unsuccessfully to infect mice with strains of the bacteria. Moreover, O’Neill notes that all the Wolbachia found so far are temperature-sensitive and could not survive inside warm-blooded animals. Still, Werren says it’s too early to dismiss the possibility completely. “We don’t have any idea whether these bacteria occur in vertebrates, either cold- or warm-blooded. We haven’t really looked,” he says. Michael – I put up 3 posts before now they have gone. Has something messed up with the computer because they were there. Can you check out for me please or maybe I messed up?? Its OKAY – I see them now – my FAULT! London – I kinda like your wasp theory. I haven’t read the links – it goes over my head a bit. You know I was stung by a wasp back in 1992 when I was travelling – I was in Italy at the time. It was after this trip that I started with the caffe late stains on my face (hyperpigmentation). No doc could find a reason for it or even anything to cure it. Funny about that. Please people don’t come back at me with a hormone inbalance theory – I don’t have one of these either. SarachConnor, The point is the OSU fibers are SO wierd, that there is almost no way they could be the result of a biological process. They bear all the characteristic of a man-made or mineral fiber. You know, the OSU information gives everyone an oppertunity to do some similar experiments. TRY THE FOLLOWING ONLY WITH SMALL INDIVIDUAL FIBERS! DON’T BURN DOWN YOUR HOUSE! What happens to your fibers if you stick them in the oven and bake on high for 30 minutes? Ovens usually go up to 500F, but if you use the “Self-clean” mode, it will reach 900-1000F. If your fiber melts in the oven then it is NOT the same as Wymore’s fibers. And, you know why an oven’s self clean temperature is 1000F? It’s because all organic matter will carbonize and crumble to ash at that temperature. So Wymore’s fibers are not organic matter. Michael – I will try that. Will wait until the man of the house is out of bed!! He is better at that stuff than I am. I will check back with you later on the burn technique! Sarah, hair growing from your head into your forehead, cheeks, etc is not part of the so-called morgellons case definition (as put forth by the MRF) is it? Are you saying this is a symptom of morgellons? (I’m not sure because you said you cannot find reference to this as part of any disease). I know you are in a lot of pain so I hope things start getting better for you ASAP, whatever that might take. As Michael says, take care of yourself! (another site note: seems like the heavy traffic is causing caching problem, so posts take a while to show up. My posts too. If you have problems seeing something you posted, wait a few minutes, and try again. If the problem persists, email me, and I’ll see if it got marked as spam). We are developing methods for non-invasive characterization of nanoscale structures at microwave frequencies. Our approach is a unique broadband frequency and time domain scanning probe microscope (SPM). Depending on interest and skills the student will participate in activities that may include: finite element (HFSS) modeling of electromagnetic wave propagation in nano wires, measurements of nano wire based devices and data analysis. We are developing microwave measurements and devices based on advanced electronic thin-film materials such as ferroelectrics and high temperature superconductors. Our project involves the growth of thin-film materials using pulsed-laser deposition, and the subsequent characterization of the films using a variety of techniques, with the ultimate goal being incorporation into device structures for further detailed measurement and evaluation. My thoughts are: Nanowires are not observed spontaneously in nature and must be produced in a laboratory, and specifically, in a vacuum. Nothing to do with biology. MHKS – Hair growing into my head? This is DEFINITELY a symptom of Morgellons. Believe me I am not the only one with this problem. Why do you think so many woman in this group have shaved their heads and now wear wigs. I wore a wig for a little while – but gave it away because the wig hair started to do the tickle thing on my cheeks and hurt like my own hair used to. I could not figure this out. It is almost like the “culprit” involved in this lives on the skin surface OR is it just floating in the air?? I don’t know, but what I do know is that it isn’t normal. So given this symptom alone – I think that says we do have a problem here. They shave their heads and wear wigs because they have lesions on their heads. I’ve never heard of anyone apart from you who claims to have hair growing INTO their face. That sounds like something a doctor would be able to see. Sarach, not to be facetious, but there seem to be so many symptoms of Morgellons it’s hard to keep track of them all. Which, I think, is the point that Michael often tries to make. Thanks for explaining though–I’ve never seen anything like that so it’s hard for me to picture. Sarach, is what you’re talking about, in any way, similar to how static electricity causes “fly-away” hair? London, I have never said I am smarter than you. But I have participated in conducted many studies in the field of psychology and can tell you that all your theories that you throw out on here are not scientifically proven or even close to meaning anything. You go on the internet and look up random things. Then say these things are responsible for morgellons while showing absolutly no corrolation to this so called condition. But, that’s our London gal, 911! I think you said I made you laugh, somewhere in here, London. I know that you know what you do to TC & me, too. I want to point out that saying over 650 is close to 760 is quite erroneous. HUGE difference, even at those temps. Melting points and boiling points that are double each other in degrees farenheit are not the same substance. Something that melts or boils at 650C is not chemically similar at all to something that melts or boils at 760C. These two just don’t equate . It’s not “pretty close” as Michael states- it’s not close at all. And I agree that the fibers are not organic, I’ve never felt that they were. There is no cell stucture or anything else that would suggest they are. We have not ruled out the possibility that morgellons could be from something inorganic getting under the skin and causing problems. It’s possible something is producing the fibers in the skin, but I’m pretty confident (and please, remember I am speaking on behalf of no one but myself, if I’m wrong, I’m wrong- but this is how *I* feel, not necessarily how any other researcher feels) that the fibers themselves are not organic. Organic basically means alive. All living things are carbon based, and that is what I mean when I say organic. There should have been carbon in the signature if they were living. There wasn’t, therefore I do not believe the fibers are “alive” Does that help? A 16% difference (you said “double”). Which, if we were measuring an exact melting point, would indicate different substances, but since the number was given inexactly as “over 650C”, I feel it was at least in the ballpark. Jace, you should have known that those numbers were wrong when you typed them, the error is so great. You converted 1400 instead of 760, and then continued to make conclusions based on an erroneous belief. This lack of empathy for numbers does not bode well for other conclusions you may draw, or have drawn, based on observed metrics. Jace, does Dr. Wymore hold a PhD in Physiology? If so, what, if anything, does he know about skin? I haven’t seen any mention of the video (fiber coming out of the toe). Was curious what everyone thought? I don’t know why they showed that video. It looks like a bit of white thread on a toe. It’s probably from his sock. People often have hardened skin on their feet, it cracks, fibers get caught in it. If it was emerging from his toe, how hard is it to take a photo every 20 minutes (or whatever the rate is) to show the progress? Obviously he just took off his sock, saw this fiber stuck to his toe, and decided it had “emerged”. Remember this is the same guy (Dr. Smith) who went to the ER because he saw a fiber burrow into his eyeball. I didn’t understand why they showed it either. I was pretty dissapointed. Hopefully someone could/will take a better video, though even like photoes they can be very deceptive. I find the lack of video evidence quite puzzling, Twinkle. This is 2006, everyone has video cameras, webcams, etc. And here are people claiming that something quite incredible is happening to them, yet no one has thought to get it on tape? The problem with microscopic photos is that EVERYTHING looks bizarre and other-worldly when magnified. But if people are able to rub tea tree oil into their arms and cause hundreds of fibers/worms/whatever to extrude from their pores, surely someone has picked up the camcorder and filmed that? Just go to youtube .. people are taking video of anything and everything these days. Sarach, I’m frightened for the people (like the really bad one, above),who think they’re “victims of morgellons disease”, and it should be evident in most all of my words. It should be evident to all who know a bit about this, that we all have good reasons to be, as anyone who knows what kind of spiralling downward occurs when people don’t take their doctors advice. What do Michael, Tall Cotton and I have to hide? Nothing. form of a response, even if only to tell me that I’m out of line. Please excuse me, I just mean to understand the nuts & bolts of what is truly going on with his studies, and nothing more than that. His letter to physicians seemed to be an act of empathy, perhaps done in hopes of pacifying patients, and of warning doctors how to conduct themselves with them. I found it very elementary, very lacking, and quite unusual, as I think most doctors receiving it certainly would. I know you aren’t accountable for Dr. Wymore, I just would like to know what is being done, other than his exhaustive fiber study, to benefit this group of people, if anything. It seems that nothing he studied before this was beneficial either, in my opinion, but certainly not in the opinions of the patients. Damn, I forgot to collect my paycheck again. This is Saturday. Do I get time and a half or doubletime for posting today? I didn’t think that 10C degrees would equal the kind of difference that Jace indicated. I thought about looking it up, but I thought that she should know, so I didn’t bother. Thanks for being on your toes. TC, there will be a union meeting on Monday. We may have to strike, for our wages. I need my pay. I broke my sunglasses!! Ok, TC, let’s bring our conversation up to the top post. That’s for sure doubletime. Big company, they can afford it. Hold on one second here!!! Damn. I’m suing for gender discrimination. Michael- typo on my mistake in doing the conversions. I should have looked more closely at those numbers before I posted it. I was chasing 5 kids and 2 dogs today and I admit I was a little distracted. I just wanted to make the statement- which is still true, that even with the right numbers the differences are too large to be overlooked or negated. I have had 2 years of chemistry and my minor is in chemistry, so I do know a little about boiling and melting points and the ranges for the same organism if you were to test it more than once would not be 100C off. And uh, Michael how in the heck can one have “empathy with numbers”? Here’s the definition of empathy: “Empathy is one’s ability to recognize and understand the emotion of another. As the states of mind, beliefs, and desires of others are intertwined with their emotions, one with empathy for another may often be able to more effectively divine another’s modes of thought and mood. Empathy is often characterized as the ability to “put oneself into another’s shoes”, or experiencing the outlook or emotions of another being within oneself, a sort of emotional resonance.” Also, I do not have a degree in math, and it was a simple mistake. I have made no judgements based on numbers in any way, so my inability to calculate (which was really just an inability to do anything with 5 screaming kids in the background), has nothing to do with this argument. A 16% difference is significant when you’re dealing with gas chromatography. Whoops. Here we go again, semantics. They gave me my first pair of sunglasses free, but told me I would have to purchase replacements if I were to break them. They also said that they would reimburse me for the gas for the van. Resources for language investigators. Skeptical analysis and debunking of grammatical and typographical errors. Jace, I can completely relate to having small children and pets running about the place. However, you are representing yourself as an individual schooled in the scientific process, and as you must know, science is precise. If you cannot be precise in your statements when you have 5 children and numerous pets running about, especially in a matter that arguably afflicts thousands of people, perhaps you should not post until you’ve got peace and quiet. If you are truly a scientist, then you know that you’ve made some very sloppy mistakes. Defending your mistakes with nearly 100 words disputing semantics is NOT credible. 105 words making excuses for a mathematical error. It’s no worse than Wacky Wymore going to the Goodwill data bank to look for fibers. Well, credibility is not what any people who think they have “morgellons disease” is interested in. Just being believed is what works for them, and nothing beyond that. “I believe you” is the only hook they need. By the way, I am in overtime now. I need a ticket from the grammar cops, really bad, on that last comment. Smiley, my point is that you don’t get to clothe yourself with the mantle of science, make statements that are patently erroneous, and then beg off because you’ve got kids and pets, and besides that, your challenger made an error in semantics. Jace is a scientist, or she is not. I was testing fibers on a gas chronomograph. I guess that would be a gas powered clock. I meant “chromatograph”, but I made a.. made a… made a… mistake!! But it’s someone else’s fault!!! Smiley, just submit your Grammar Citation to The Company along with your monthly expense report. They’ll pay it. I once made a filet mignon for my hubby, but he said it looked like a hamburger. Smiley, I’m not offended at all. If I were that thin skinned I wouldn’t have come back here after the first attack on me. I welcome all questions, and if I make a mistake (as I did above) I acknowledge it. I don’t mind answering any questions, as long as it’s not something that could cause issues with my job. I know you think I’m biased toward believing it, but I truly am not. I, like you, really do want to help these people who are self-mutilating because they’re so desperate, whether there is a real “disease” or not. Also, I won’t be a masters student in Wymore’s lab. When our new faculty member gets here I will be her research assistant, and whatever work she is doing will be the basis of my masters. I would not say we spend the majority of our time on the fibers. We really can’t do much at all with them because we don’t have the equipment the police department or even our forensic department has. What I do lately is grow out the bacteria and fungi in the patient submitted samples and try to determine if they could possibly be pathogenic. But, as I’ve said before- patient submitted samples are going to have the normal bacterial flora and this isn’t an ideal study. After we receive the approval for human tissue studies we’ll be able to get much more accomplished. We won’t spend days growing out cultures only to find that they are bacteria that already on everyone’s skin. As for our research, we aren’t directly helping patients- that’s not our job. Our “value to the patients” comes from our trying to determine what is going on. Our job is to research the who, what, when, where and why. The physicians and nurses, PA’s and NP’s are the ones who are making immediate differences in people’s lives. Research can take years. I’m not sure I answered your question, so if you have more questions I’d be more than happy to answer them, but I have to take a computer break tomorrow, but I will answer anything coming my way (that I can) willingly. What I think everyone is missing here is that we want to know one way or another if morgellons is a novel disease. For me, I just want an answer- is it a real disease, or is it just clusters of similar symptoms? It’s not a life shattering event for me if the research ended up showing that morgellons was some bizarre “disease of the internet age”. I just want answers, period. I do still believe that morgellons, while maybe not a disease per se (I think syndrome is better terminology), is definitely something new and it needs to be addressed. You’ve heard the last from me. I can’t believe people are up so late at night waiting for someone to attack. Well, it won’t be me any more. I was NOT writing a scientific paper, I made an error in calculations on a BLOG. I’m a human AND a scientist, so sometimes mistakes are made. My time and energies are better spent elsewhere anyway. How far along is the CDC with their investigation, or do you know? Jace, Michael has told me that you are who you claim to be, and so I am operating on that belief. Michael has told me that you are a scientist. Science is precise. You don’t get to make statements and then, when they are proven incorrect, blame them on the kids. Science is precise. You also don’t get to stomp out in a huff when your arguments are proven invalid. Science is precise. Either your science is valid, or it is not. And as for wasting your valuable time on a BLOG, one must wonder why you came here to start with. I am pretty sure there are scientific forums you might have posted to. Uh-oh, we may not get paid now!! Ut-oh, I think I might have left a participle dangling. Dammit, I was hoping my quarterly Good Grammar Bonus would cover my Direct TV bill. Nobody qualified for a good grammar bonus this quarter, sorry. Jace, that melting point dispute is meaningless, the real point is that there are several man made fibers that have high melting points, but nobody has mentioned an organically produced fiber that does not melt at 1400F. It’s gonna be hard to work without sunglasses! Yeah, try being D’Artagnan without a cloak. Ok, I am really really going on strike after this post. That’s the thing, Michael. Either the fibers are organic, or they are not. Jace seems to be saying that they are not organic. If that is true, then they cannot be produced within the human body. It’s not possible, thus it must be external contamination. Ok, off on strike now. I do, by the way, want the pewter buttons on that cloak. There’s something in the Morgellons case definition for everyone. Everyone has fibers on their skin, and in and under any scabs that they have. Chances are very good that some of those fibers are unidentifiable. Are all of the fibers as resistant to heat as Wymore’s speciments? Probably not. That just depends on the type of fiber contamination involved. Here’s a chart that shows some melting points of insulation materials. Note: The temperatures are in C.
Sorry I missed you guys yesterday…..
Why don’t you look toward Lucent Technologies for the fibers? As for our research, we aren’t directly helping patients – that’s not our job. Our “value to the patients” comes from our trying to determine what is going on. Our job is to research the who, what, when, where and why. Your “value to the patients” (and I think you’re almost actually unaware of the scope of it), is because you have believed them. In the role of your job, I’d like you to explain the reason why “how?” is not part of the equation. What I think everyone is missing here is that we want to know one way or another if morgellons is a novel disease. I think you’re wanting people to believe that anything done in Dr. Wymore’s lab is going to be productive toward helping these patients. That might fool some people, but not all. Interview them, and you’ll get to the crux of the matter a whole lot faster. That will allow you to realize, right away, that it isn’t a novel disease. Since you’ve won their trust, you can advise them. You can’t call the shots, though, I realize that. I don’t think that would be conducive to a grad study lab project, though, either. Wymore chose one which is guaranteed to go on forever, basically. I do still believe that morgellons, while maybe not a disease per se (I think syndrome is better terminology), is definitely something new and it needs to be addressed. What made you believe that? Aside from the people in this group who have MRSA infections, this is nothing new. Jace, they chose not to address what it is. That is a well known fact. FYI, I just finished reading all the above post, and would like to say I don’t post anonymously, so that was not me up there….but you guys probably already knew that. Hey, I just picked up my paycheck and I’m missing 16 hours overtime from last week. Oh no, nevermind. It’s all there. Two checks were stuck together. Thanks, Michael. Hi, London! I figured Randy blew a fuse and posted all that. I don’t think that was Randy – it was the same person as FibersToo, the textile industry conspiracy person. Randy is more polite. London, you may as well look at Drosophila. Try to figur out the connection between the wasp research and Drosopila research. Feel free to ask if it’s not apparent. The New Morgellons Order; Cliff, Charles, Cindy, Greg, and Judy appear on the X Zone radio program. Scheduled between the paranormal ghost expert and Willie “Wind Walker” Gibson, the Cherokee Indian psychic, along with the usual UFO sighting and abductions experts. Can you read me, Major Tom? I am ready for the next X Zone program. Hey there Smiley!! You have still been cracking me up w/ your quick wit!!! Ted and Prince3 (the GM one) sends their hellos too. Why are you so against looking at the parasitoid wasp? They make cocoons (which one was found in my home) as well as the balls of fiber-looking cocoons they use as a nest when they are inside the other insects. Why wasp and not the fly? Simple…Flies (the white fly, does extensive damage to our crops) plus, the wasp, well it’s all about ecology and those damn trees. You see the wasp attack the beetle and that beetle is eating away at our eucalyptus trees. And to the tree huggers, that is more precious than my life or my health and well being…. Michael, How do you think some of the biotech people live with themselves? London. Lots of insects make cocoons. Hey London, can you explain the principle of Occam’s Razor? London, hi. Tell the guys I said hello, back to ‘em. Be careful shavin’ with that razor Michael is talking about. I’ve heard they’re real sharp, and can cut you before you realize it. We know you didn’t post that info on all of the topics. That isn’t your way of doing things. Although, that poster did take your ideas from biology online, almost word for word. I’m not trying to help ya cheat, London, but that is the principle, I think. They never need sharpened, or to have the blades switched out. You might want to double check that, but I think I’m right. It is not videotaped because the fibers that zap the skin are like invisible clear wire threads that travel swiftly. If the light is just right it will ‘light up” the fiber and you can see it for an instant. Those are the ones that cause a burning pain and are filled with a static like liquid. I think we may have a winner, for name that fiber! Is that mystery fiber the corner of my paycheck for debumking by any chance? It’s a $20 bill. Look closely and you will see all new money is infected with red and blue fibers! Is this the infection vector? Peachy Morgellon Money – but people have had this LONG before the new money came out. I’ve been tightening the chin strap up so much on my helmet, lately, that it just gave way to wear. The protective padding inside this old thing has been worn down for quite some time anyway, so I have to put in for one of those newer models, for sure, now. My purple vortex shades still work, but I could also use a new set of those sunglasses like the ones TC broke. You know, the type that helps a person see around corners. I understand we had a choice in our selection, and we have to pay out-of-pocket for replacements, but those robotic wasps are so stealhy, I really need a pair. I can’t bear to look at money, in any form. Perfect logic, Rose. People have had this since long before we had any form of legal tender. I am a 48 year old male in Connecticut. I am a runner, a bicyclist and a frequent paddler of the nearby river. Im in good physical condition. Emotionally strong and determined with good analytical skills. Only serious problem in my life is Morgellons. Dont believe me? I will give anyone the address needed to meet me and then submit myself for a complete examination. Perhaps the skeptical would prefer just a hug,………not to worry its not really contagious because the evidence is delusional. So, who out there is willing to put their skepticism to the test instead of just professional lip service. I’m not a doctor. Why don’t you submit yourself to a doctor for a complete examination? Then you may find what is wrong with you. The “hug test” has been suggested MANY times before. And debunked as many times as that. So, no, I’m not going to hug you. Feel free to explain how that proves something. Maybe we need to begin a “Go Hug A Doctor” campaign. I once read an account of a “victim” who’d rubbed all of her doctor’s sterilized instruments all over herself, when the doctor stepped out of the exam room. Amazing, the ways people don’t realize how everything they say, says so much. They geniunely see nothing the matter with the picture, other than that we’re all complete nincompoops, and they’re trying to warn us of what they think has just yet to come our way. Imagine that kind of fear, thinking rather, that we’re the ones in denial and really terrified for ourselves, or that we need to be. We’ve got a delightful person who has posted here at least twice that s/he gives blood in the hopes of spreading Morgellons, specifically hoping the the blog owner somehow manages to receive that specific pint of blood. Anyone who believes they’ve got an infectious disease and deliberately attempts to pollute the blood supply, is despicable – whether or not they actually HAVE any disease. The intent remains – to do bodily harm to a random stranger for one’s own interests. The same goes for deliberately contaminating a doctor’s equpment. Disgusting. Its the smileykins,tallcotton, and morgellons show! Stay tuned folks! But bear in mind, they’re all perfectly balanced, mentally, Jeezelouise. Randy,it used to be “The Bugs Alive & Adapted Show”, as you probably are aware of. Oh well, gotta earn a living somehow. Hehehe. Thanks for the publicity. Now, you’d had some questions, over on another topic thread. What were you referring to, that nobody answers questions for people, here? That’s all the boss, Michael, does!!! Oh, Jeezelouise works here, too, but in another job category. I think she might have better fringe benefits. Yes, I work in the espionage section. Damn it, I love it, You all were picking on me and I friggin missed it!! Sorry, I was gone for two days or would have respondes sooner. Damn, I like it when you guys gang-bang…. and I unfortunely can’t spend anytime here tonight, gotta go get lessons prepared for 24 non-english speaking Kinders in the morning…. ( yes Diane, I started back working…you know, so I will not scratch…..that’s if I get a job….Anyway, I think that is how you put it…) Thanks for your incredible wisdom and insight QH! okay, gotta run, will check out your new strand tomorrow…. The finishing of fabrics with flame retardants can reduce the tendency to burn or reduce the tendency to propagate the flame. The flame retardants may char the fuel, quench the reaction of combustion, absorb heat or emit cooling gases or replace oxygen. Flame retardants are durable or nondurable. Durable retardants include decabromodiphenyl oxide, antimony oxide, phosphates, brominated esters, PVC and other chlorinated binders. Nondurables include borates, boric acids, zinc borate, sulfamic acid sulfamates, ammonium phosphates, urea, etc. Hydrated alumina and zinc borate act as smoke supressants. Problems in the application include odor, yellowing, loss of tensile strength, stiffening, skin irritation and color change or loss. Sulfamates are used to fireproof cotton and wool. I’m not a chemist but they do contain Sulfur, and could perhaps produce Wymore’s Sulfur signal. I’m not sure, however, how common these fabrics are. I’ve noticed so many people that say they have Morgellans desprately wanting (or threatening) others with the “disease”. Don’t you think that says something about someones mental state? I understand the frustration…but the “c’mere and hug me so I can give it to you and you can be sick and misserable too” is a line that’s being crossed…over and over and over again. If the person is serious, I think it says a whole lot about his or her mental condition, but I think that they are mostly just venting their anger and frustration. In my opinion, based on my past and present observations, I believe that a lot of mental conditions come through very loud, and very clearly. It’s not all just crazy talk, it’s been discussed on Lymebusters, etc., that they should issue the “meet me, if you think it’s not real”, challenge, or bet, as a way of “proving” that the skeptics secretly believe that Morgellons is real, or that I am part of some vast conspiracy. They don’t actually want me to say yes. I’ve had to explain the problems with this logic several times. I need to start a FAQ. I know. I also think they count on the skeptic turning them down. But some of those people seem so out of control that I wouldnd’t trust them not to try to do something even more stupid. Others, although I don’t believe in Morgellons, could have something worse than what it’s case definition claims, and much more communicable. I’m not afraid of Morgellons, and I’ve proven that to myself. That’s good enough for me. I thought it was fun trying to figure out what was in the mystery photo. I think it would be fun to do that once a week. It could always be types of fibers, but it wouldn’t have to be, just something related to this blog in some way. Congrats to Andy. Thanks Michael for the fun. P.S. I still need my see-around-the-corner sunglasses repaired, and Smileykins wants a chocolate malted falcon. The infected $20 goes to anyone who correctly identifies both. Plotting & planning among themselves to say such things and that ain’t even more you-know-what??? See there, we all need new helmets. What do I win? I already have tough little white fibers emerging from the skin over my left scapula so I’ll say “no thanks” to a hug. When I was looking for fibers coming from the body, I didn’t realize that it could be a disease. What I was looking for was a type of thick wirery fiber (just one fiber) coming from the head of a person. It can be trimmed but not pulled out, and it definitly not a piece of hair. What does your doctor say about it? i would just like to say that there are delusional people as well as hypochondriacs. theres always going to be folks who think they have a disease as soon as they hear the symptoms. the problem here is that my girl and i were desperately trying to find out what these long blue threads, “living” hairs with stingers, pepper specks, little burying larvae were before we happened upon morgellons by definition. there are simply just too many people with a very similar description of their affliction to entertain the thought that this is delusional. sure, it might be tough to weed out who really is delusional or suffering from a similar illness, but let that not slow the progress of a genuine very disturbing presence that is worthy of the term ‘emergency’ increasing globally, exponentially. -not unlike the beconing state of our planet.